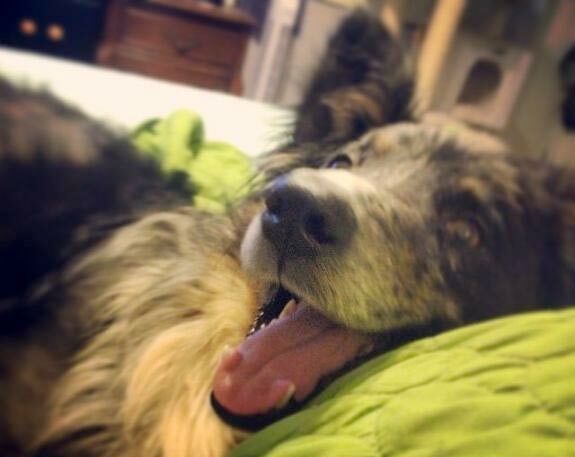 Tripawds Community member anitalynn is recipient number eight of the Maggie Moo Fund for Tripawd Rehab. Read on for details about Anita’s experience with rehab for Chloe The Boxer. With only two more reimbursements left from this fund, please consider a small contribution to help keep this program going! 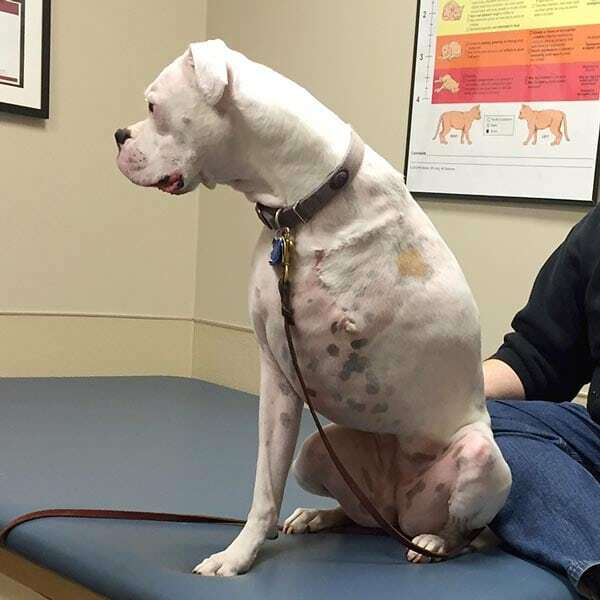 Chloe is a 6 year old Boxer that had a front leg amputation performed on February 16, 2016, after a soft tissue sarcoma diagnosis in January. Chloe has been doing really well since her surgery, but we noticed that on busy days she was very shaky and muscle fatigued by the end of the night. Occasionally, we would notice that she’ll catch herself off balance and correct the movements. We want to do all we can to prevent other injuries and appreciate a professionally trained perspective on the situation. 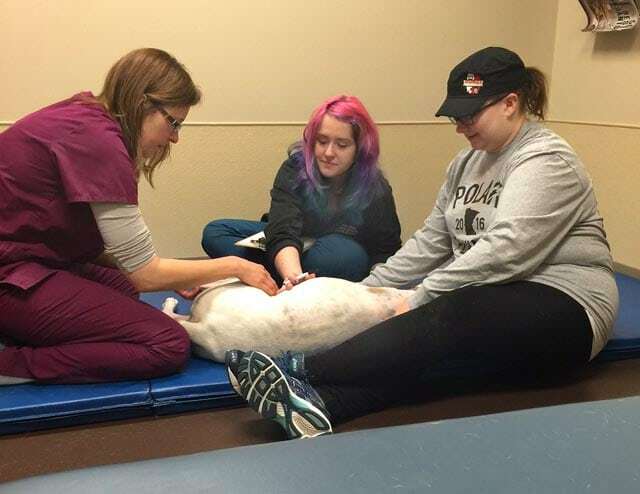 I noticed a post in my Facebook feed from Tripawds, talking about the benefits of rehabilitation therapy for canines, and used the linked search page to find a certified therapist near us. 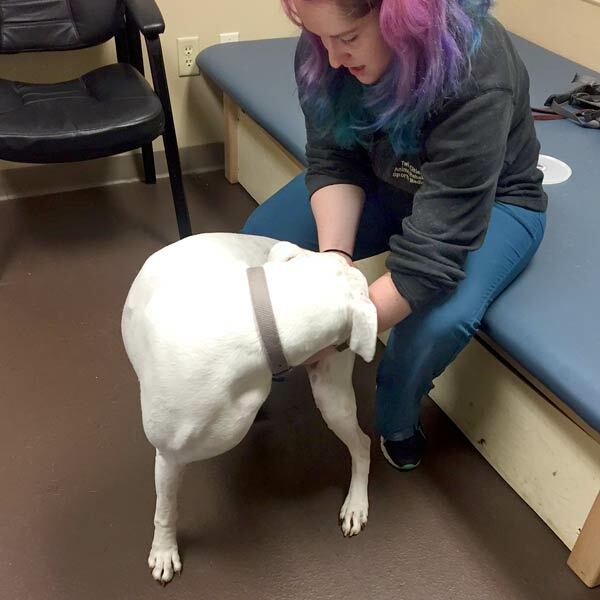 On March 25, we brought Chloe to the Twin Cities Animal Rehabilitation & Sports Medicine Clinic for an initial evaluation. Dr. Amy Whaley, DVM CCRP CVSMT, and staff were really great. Our visit started with a questionnaire about Chloe, her lifestyle, and what we hoped to get out of the visit. Then Dr. Amy began taking measurements of Chloe’s range of motion, and of her muscle circumference. We talked about the importance of keeping Chloe’s core strength strong, as well as the importance of building up strength and stability in her remaining front wrist. Chloe’s right rear thigh is slightly larger than the left, and they noted that she is relying on the back right limb more frequently which can explain the difference. Taking measurements and checking reflexes. We then let Chloe get up and walk about for a moving examination. They took notes about her gait, paw reflex and response, and more details about her core strength. Dr. Amy observed how quickly and with how much stability Chloe can fully rise from a sitting position. She noted that Chloe’s not using her hind legs to push herself forward as much as they’d like to see, Chloe is hesitant to fully rise initially and muscle fatigue is easily seen when doing this movement. Something to work on! 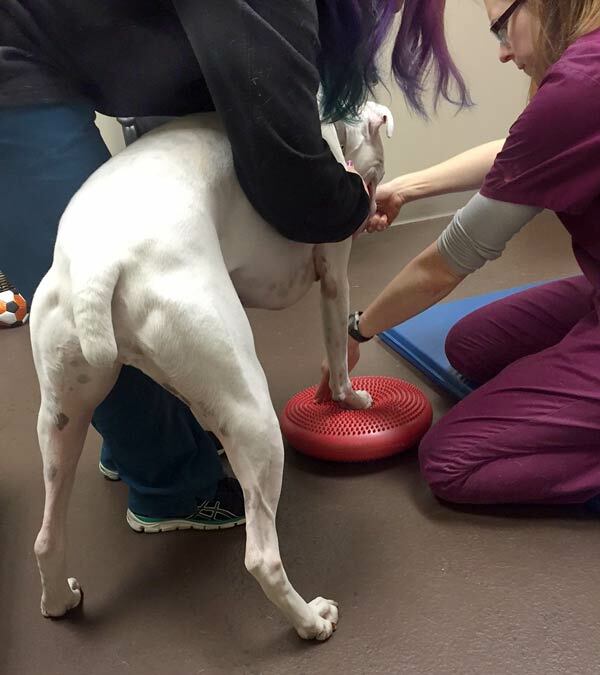 They took out a Balance Disc and observed that Chloe is not “gripping” well with her remaining front paw. 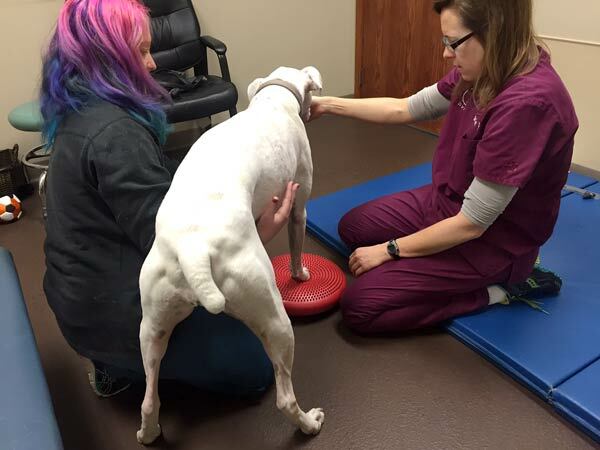 Dr. Amy explained that Chloe will likely need wrist support at some point in the future, but we can prolong that need for a while with some strengthening exercises and working with Chloe on engaging those pads in her paw to help distribute the weight more evenly instead of stressing out that wrist. Standing on the balance disk, eating treats, not even realizing that I’m working out! Our visit wrapped up with a chiropractic treatment, and an explanation of the five recommended daily exercises and stretches we can do with Chloe. The easy ones – a treat stretch, three times on each side, daily; and some shoulder rocking massage which looked relaxing for Chloe. Side crunches, time on a balance disc, and practicing her sit to stand will be a little bit more work for her, but we are excited to see how she progresses. Dr. Amy stressed that physical fitness, including keeping Chloe at a healthy weight is key to her recovery and long term strength. She also recommended a joint supplement called Dasuquin, explaining that it is generally recommended for “middle aged, large breed dogs” but especially for Chloe, given her situation. Shhhh, don’t tell Chloe that she’s middle aged. She still believes that she’s a puppy. Chloe practicing her treat stretch! We are scheduling a follow up visit for a few weeks from now, and are excited to find ways to include the whole family in Chloe’s wellness routine. Hopefully she’ll be participating in an active summer with the family! Help Keep The Maggie Moo Fund Going!! Thank you, Tripawds, for your support! So glad you took advantage of the program! Sounds like some great at home rehab work for Chloe! How is it going? Hope she is doing well!